Established in 2014 by knitter/designer/cat mama Kristine Rodriguez. Handmade out of her Seattle, WA studio. One True Sentence: We are human. Our bodies change and our seasons change, which is why we create womenswear that honors this natural ebb and flow within ourselves. DECLARATIVE knits are comfortable, as well as polished. Timeless and versatile. These garments meet you where you’re at and will last you for years to come. Here you'll find pieces thoughtfully designed to serve you throughout the seasons of the year and seasons of your life, painstakingly perfected to be worthy of your closet. While walking the line between innovation and utility, DECLARATIVE pushes beyond what is expected of handmade knitwear, while still maintaining the ease and comfort inherent in the craft. Note: This is not your grandma's knitwear. In an industry that’s constantly racing towards the next trend of the week, we’re here to be slow. DECLARATIVE is entirely handmade by our designer/knitter Kristine Rodriguez out of her Seattle, WA studio. 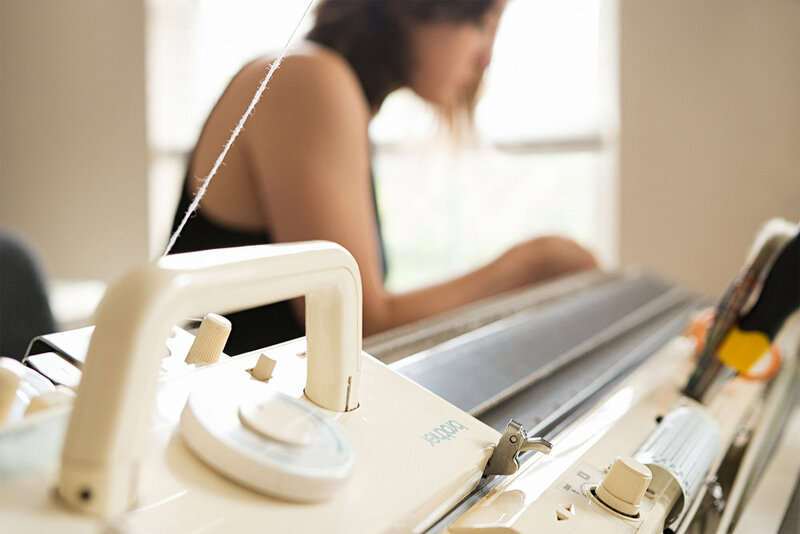 With spools of yarn and her hand-powered knitting machine, Kristine meticulously builds the fabric and silhouette of each garment one row at a time. Working on the knitting machine is a completely manual process using good old-fashioned arm strength. To knit a row, the carriage is pushed across the machine bed. This continues back and forth to build the fabric. So basically, every day is arm day. For any color changes, new yarn is threaded through the machine. 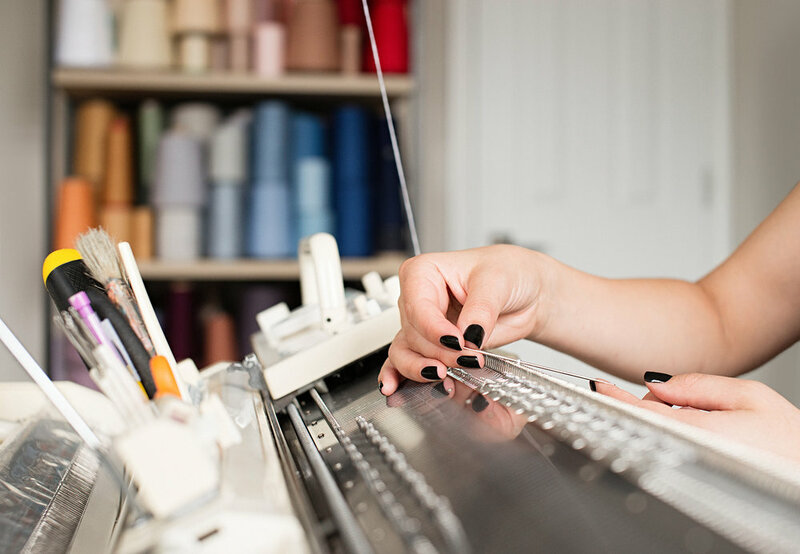 To create slopes, lace and various textures, stitches are manually transferred onto new needles. Overall, this is a meticulous and labor intensive craft. Let's just say, it keeps the mind sharp, arm muscles toned and fingers nimble. DECLARATIVE is produced with quality yarns of either natural or regenerated-natural fibers. We make it a priority to honor sustainability in as many aspects of our business as possible. This includes our materials, as well as our production process. Learn more about our sustainability practices here. DECLARATIVE founder + designer, Kristine Rodriguez, was finishing up a graphic design degree at the Rhode Island School of Design when she discovered the knitting machine. It was during her final semester in an elective class, and it was a game changer. As she explains, "When I started, it was just immediate love. It was all I wanted to work on. My whole semester basically became dedicated knitting and it has been my path ever since." Kristine graduated in the spring of 2012 with this one class under her belt and knitwear as her new direction. Unfortunately, she entered the workforce completely unqualified to pursue this passion. There’s a stack of unanswered job applications somewhere attesting to this fact. However, what used to be perceive as a stack of failure turned out to be a gift. Unable to get a knitwear job, Kristine decided to create one for myself and started DECLARATIVE (what was originally called RESPONSIVE TEXTILES <3). As she explains, "Although I speak with yarn and the knitted stitch nowadays, my graphic design sensibilities continue to influence my work and craftsmanship. It shapes my creative voice into what DECLARATIVE is today." From RESPONSIVE TEXTILES to DECLARATIVE. Coming soon.